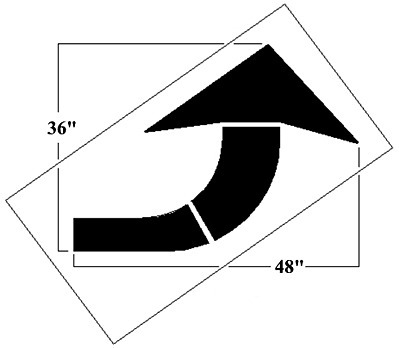 Mark your roads & parking lots with this Curved Arrow stencil to help direct people more effectively and make your roads and parking lots safer. Shipping: on large, fragile or heavy products are handled OFFLINE AND BILLED SEPARATELY (OR WE CAN USE YOUR UPS ACCOUNT NUMBER). Tax: More states are requiring us to collect tax. If this happens it will be billed separately as well. We can make stencils as large as 30 feet in size. We also collect tax on all items shipped to CO.